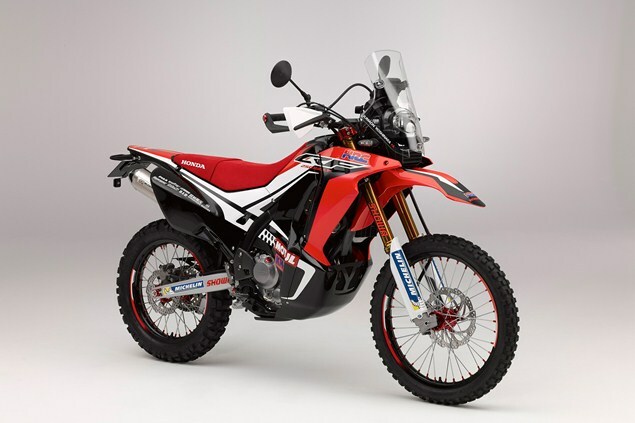 HONDA'S CRF250 Rally – revealed in March this year as a concept – looks likely to be launched in production form soon. The firm has just trademarked the name 'CRF250 Rally' in Europe, suggesting it’s got plans to use it commercially on a showroom model. Given that the original concept was effectively just a standard CRF250L production bike with a set of bodywork aping the firm’s works CRF450 Rally machines, as used on the Dakar, there’s virtually zero R&D investment needed to create a mass-made version. As well as trademarking the name, Honda has filed design patents for the bike’s styling, and while these are only computer-generated CAD/CAM drawings they do show a couple of differences when compared with the concept. Notably, the patent images show a road-legal CRF250L exhaust instead of the concept’s race version, as well as different brakes, mirrors and bars. When will the bike be launched? That’s not known for certain, but the EICMA show in Milan where the majority of next year’s models will appear is just a couple of weeks away.